Infrared thermography, coupled to the blower door test is the most effective method to identify and document security with the presence of air leaks (drafts) from wooden structures, wooden roofs, doors and windows. Maintaining the building under test to a pressure lower than the exterior by means of the fan of the blower door, the outside air will tend to enter the inside of the building to balance the pressure. 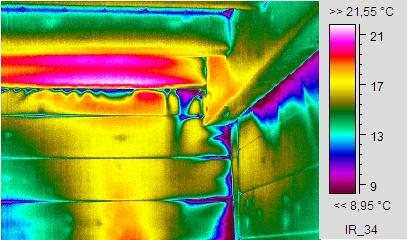 It ‘just a slight difference in temperature as the outside air to cool (or heat) by convection internal parts with which it comes into contact (roof, walls, doors and windows) so that they are identifiable through thermography. 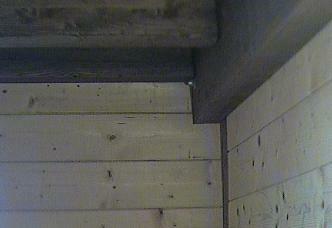 This technique is excellent both to improve the air tightness of buildings under construction, is to document the correct (or incorrect) their execution. 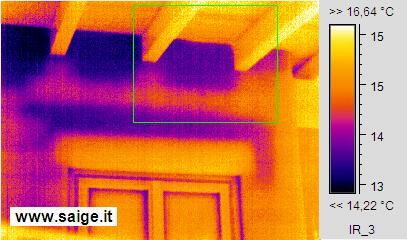 The following pictures shows the visible photo and the photo to infrared (thermography) of the infiltration of cold air in a house made of wood incorrectly.